UCF Special Collections & University Archives welcome individuals who wish to curate special exhibitions in our department. Exhibits will focus on materials held in Special Collections & University Archives and can be created from either our book or manuscript collections. 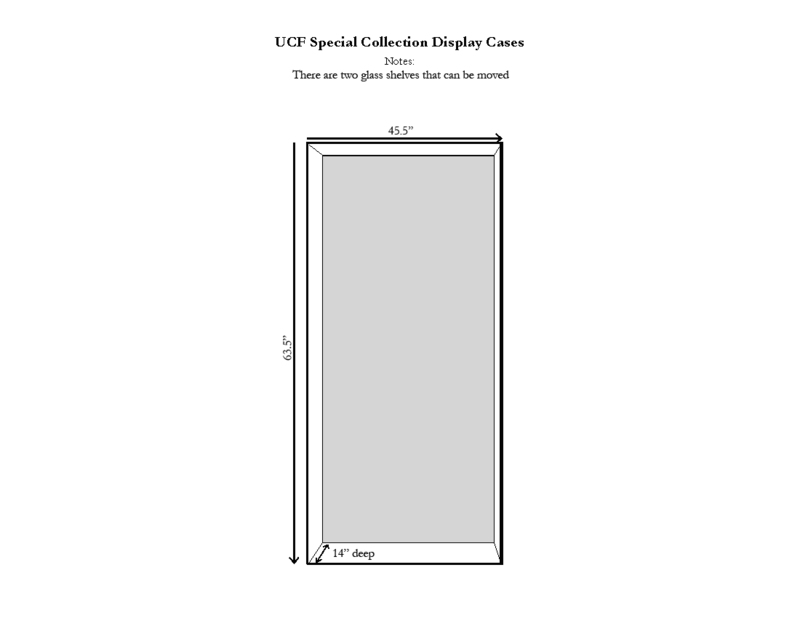 Exhibits are chosen on a case by case basis and cannot be guaranteed exhibition space until approved by the Special Collections & University Archives staff. For further information, please contact the department. 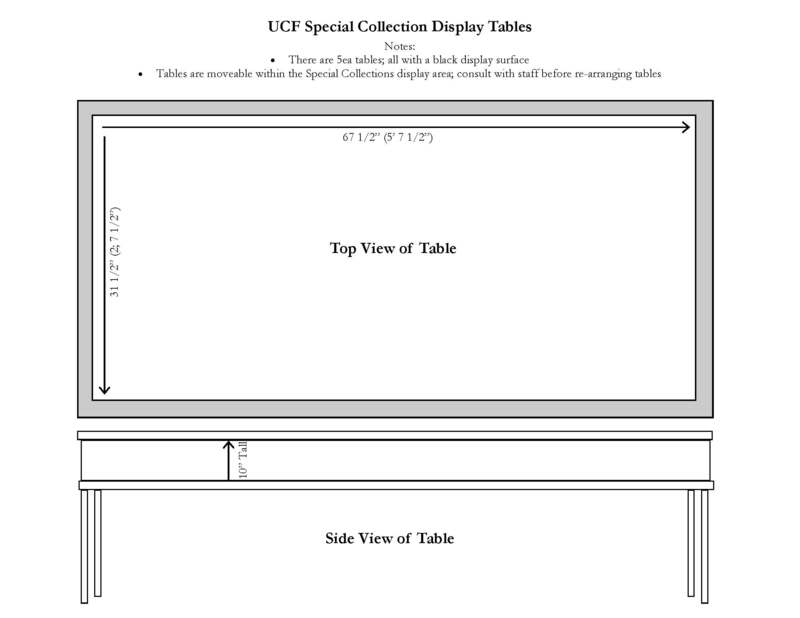 To see dimensions for the display cases and tables, please click the links below. All of our exhibits can be found in STARS (Showcase of Text, Archives, Research, & Scholarship) at this page. Archives Month Florida – The Society of Florida Archivists, in conjunction with the Society of American Archivists, celebrates October as American Archives Month. Caribbean Expressions Art, Life & Culture – This Exhibition features art from the William L. Bryant Collection, the Richard H. Shoemaker Collection, the Latin American Collection and the General Library Collection all on loan from UCF Special Collections as well as works from the private collection of renowned artist, Edouard Duval Carrié. Celebrating 50 Years – To celebrate the University of Central Florida’s 50th Anniversary, this exhibit highlights many university “first” and explores the history of various departments, faculty, staff, and students who have contributed to the growth and excellence of the university and greater community. Florida – The Land of Enchantment – We are pleased to present our new exhibit from Special Collections which features items from the Floridiana, Mickler, and Ephemera Collections. This exhibit chronicles Florida’s history from the 1850s through the 1950s, and highlights the individuals who came to settle and vacation in Florida. This history is seen through travel journals, diaries, correspondence, and travel brochures. Mulford B. Foster’s Art – Mulford Foster (1888-1978) was a respected plant collector and artist who gathered, hybridized and worked with plant life, specifically bromeliads. Through his world travels with his second wife, Racine, the Foster’s were credited with discovering several new bromeliad species. Mulford used his creative talents to document both his beloved plants and the world around him. Racine eventually had Mulford’s artistic work photographed to document his legacy. The images in this web exhibit are largely the result of those efforts. UCF Student Book Arts Competition – The UCF Student Book Arts Competition is an opportunity for students to showcase their hand made artists’ books and have them added to the permanent Book Arts & Typography Collection in the Special Collections & University Archives Department. Each year, a panel of jurors selects the best entry or entries to receive a purchase award. Women – African American Legacy – Featuring photographs from African American Legacy: The Carol Mundy Collection, this exhibit showcases one hundred years of the lives of women; from the 1850s to the 1950s. We invite you experience the history of the African American woman through the eyes of the camera.